Goosie-Adopted!!!!! | One Dog More! Just have to share this beauty. 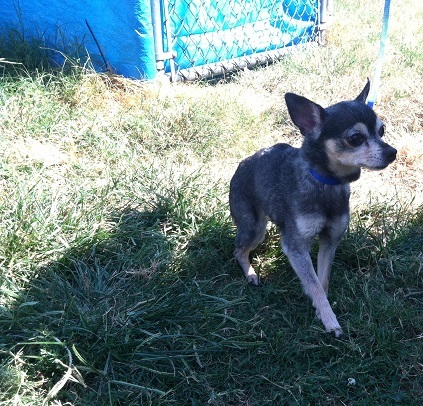 Goosie is a beautiful grey 8 year old Chihuahua that was dropped off at BARCS. She is up to date on her shots. She is spayed and microchipped. Goosie has luxating patellas and has bent back legs. She has come a long way since we rescued her and she loves going for walks. Goosie is a doll and once she knows a person is safe, she will climb into a lap for some love. This entry was posted in Adopted! and tagged Chihuahua, female by onedogmore. Bookmark the permalink.